When custom building or remodeling your home, no one will bring you more pleasure and satisfaction than Signature Iron Doors. Your entry door is the first thing guests will see. Not only do Signature Iron Doors present a sophisticated visual for all, but their ability to withstand all weather circumstances and trespassers make them invaluable. We at Signature Iron Doors pride ourselves in our work and relationship with homeowners nationwide. 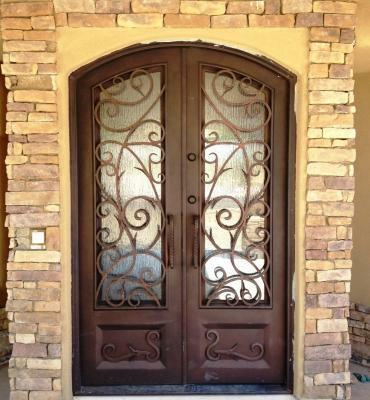 This family in Arizona wanted a door unlike any others, so our design team worked with them to come up with a design unique to them while maintain our Signature Iron beauty, durability, and security. Call us and come by our showroom in Phoenix Arizona to discuss with a sales representative about your custom double iron door possibilities.